about whom we are and what we represent? witness and response through its photographic collections. Arden Street, off Opoho Road. A folder of invoices can offer quite fascinating information. 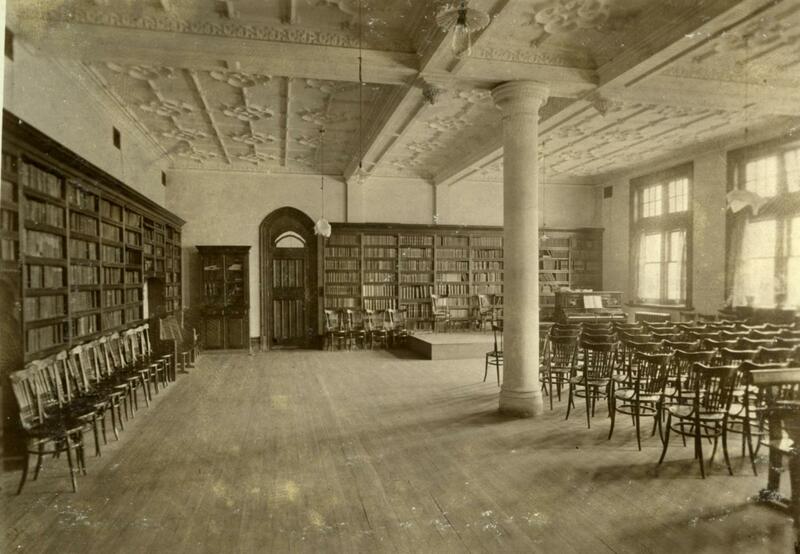 Among the personal papers of Sir John Ross is a collection that gives us an insight into the high standards the founders of Knox College wished to attain when it came to furnishing the new College. The invoices and correspondence are all addressed to John Ross, later knighted, who was the main benefactor and took the responsibility though his Company Ross and Glendining for ordering the required furnishings and crockery. 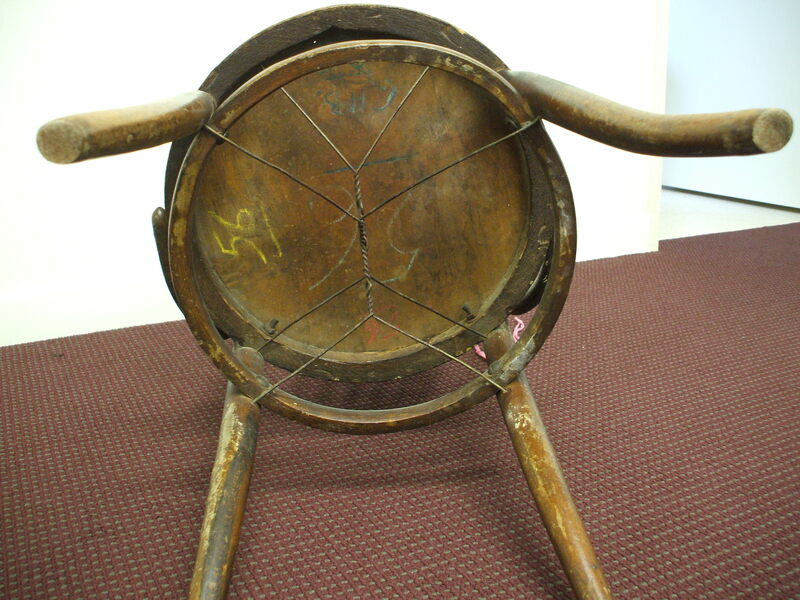 One of the few artefacts which have survived from the establishment of the College in 1909 is a chair, possibly a dining room chair. An order was placed through James Park & Co. Importers, General Agents & Indentors in the NZ Express Building Crawford Street, Dunedin on 9 September 1908. 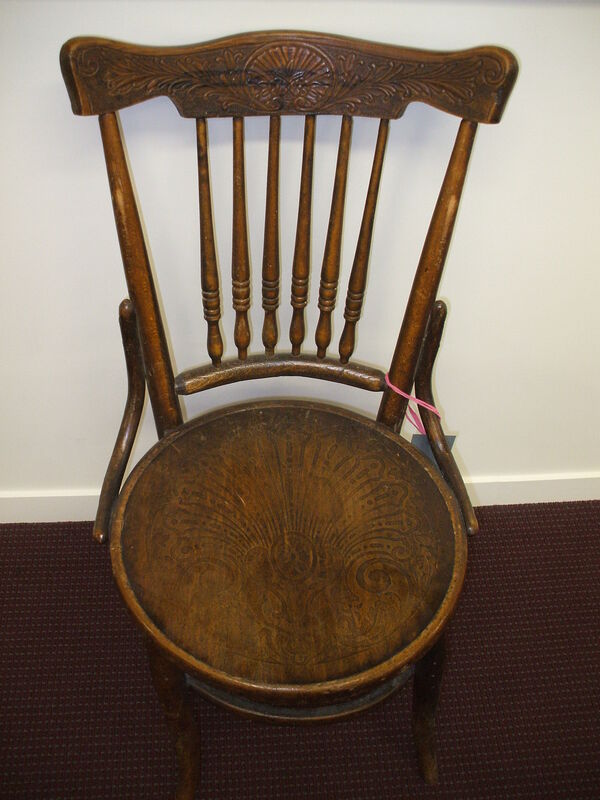 Described as Canadian Chairs two models were ordered; 80 chairs with arms made of solid wood with shaped seats for the students’ studies, common room and library and 224 for the dining room, bedrooms, classrooms and servants quarters. The cost of the dining room chairs works out at 5 shillings and ten pence each. 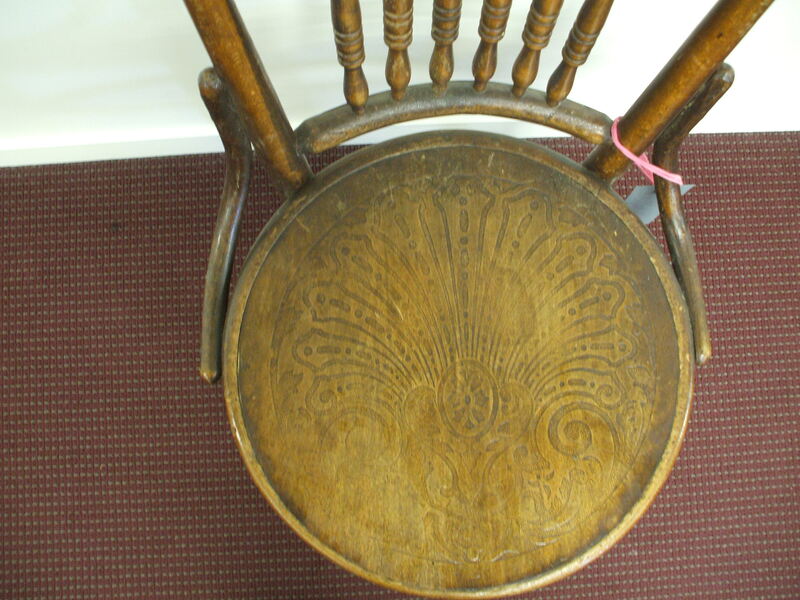 An additional 4 pence was added for a reinforcing of cross-rods to be added to these chairs ‘binding the feet diagonally together’ bringing the cost of the chairs to £69. According to the Reserve Bank inflation calculator that today is roughly $26,000. 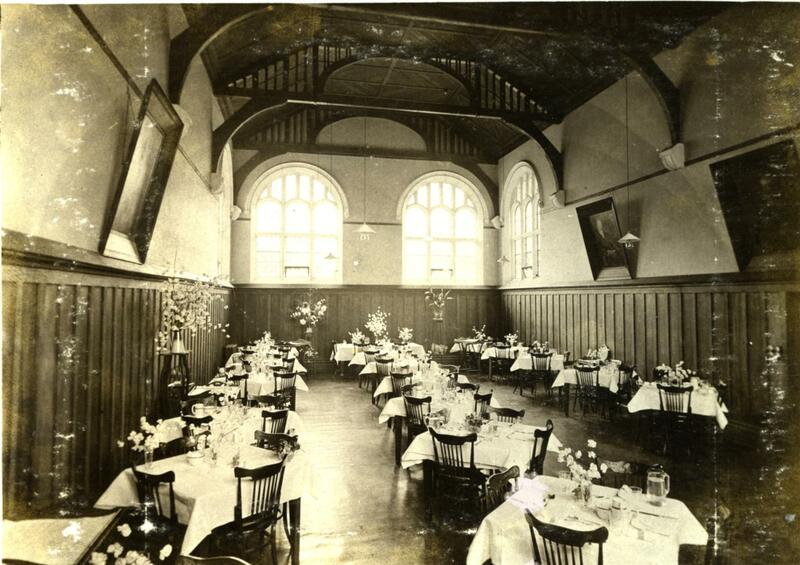 It is interesting to note that the recent refurbishing of the Knox dining room, 100 years on, an appeal was launched to donate a chair at the cost of $250. The actual cost of the chair was $285. It is apparent that the cost is more than double what was paid back in 1908. 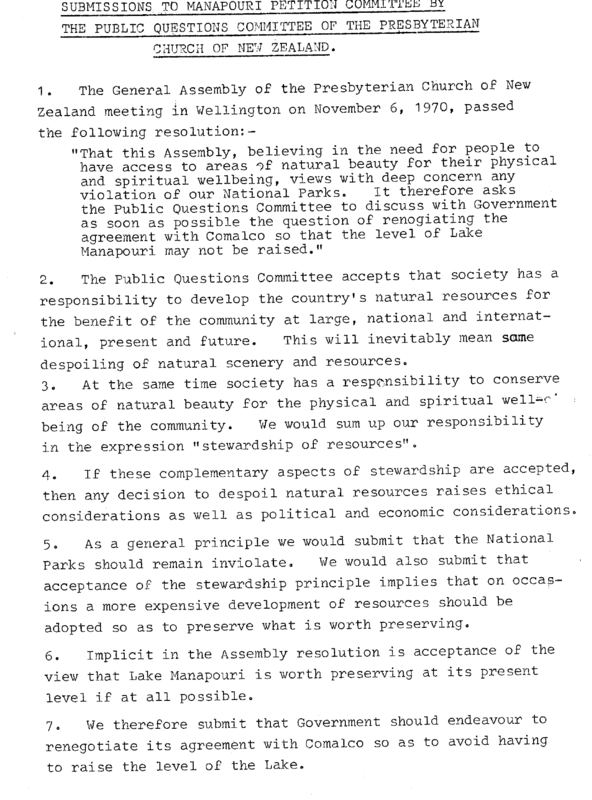 A note at the bottom of the quote for the chairs states: “our prices are based on a profit of 5%.” No doubt there is a considerably greater mark-up these days! The happiness of the human race depending to a large extent on the inspirations of the cook, it follows that, all the world over, cooks need cookery books so began the small review of the St. Andrew’s Dunedin Cookery Book in the 1927 Outlook. The Reviewer was expounding the wonders of its 12th Edition which included cooking for invalids, first aid to the sick and injured, household hints and advice to mothers from Sir Truby King as well as approximately 580 recipes. This edition had brought the total sales of the Cookbook over 22 years to 61,000 and raised £700 (roughly $64,157.48 today) for local and overseas mission activity undertaken by St. Andrew’s. 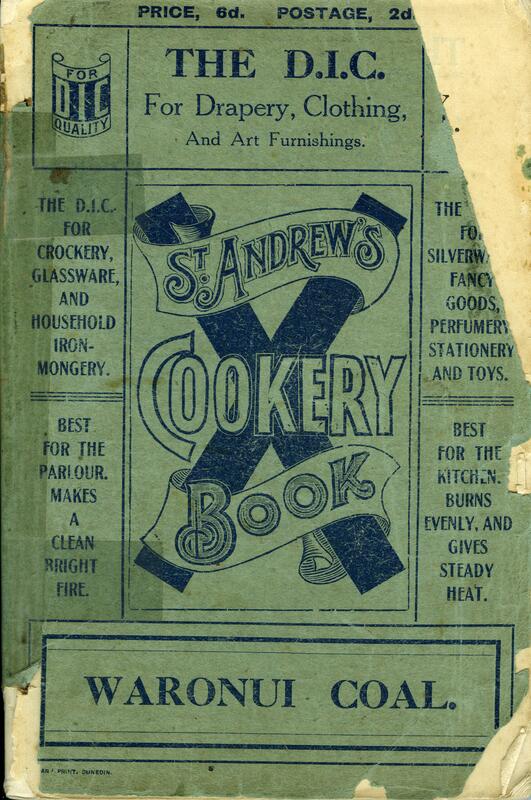 The idea for a cookbook initially came from Mrs Robertson of the St. Andrew’s Friendly Aid Society, an organisation of women who assisted the large number of poor who lived within the St. Andrew’s parish bounds. Considerable demands for funds to support the local mission activity had seen the Society seek out creative ways of achieving their goal. The cookbook idea was novel and quickly taken up by the Society. Four women formed a Committee in August 1904 and set about gathering recipes from parishioners and friends. By December 1904, 2000 copies had been published and ready to sell. The Cookery Book, the first community fund-raising recipe book published in New Zealand, was a great success with all 2000 copies sold by May 1905. 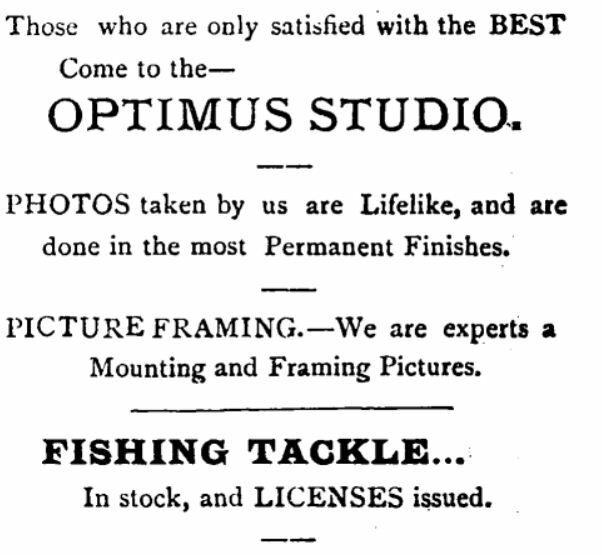 It was such a success that the Committee had two offers to take over its publication and sale. The women chose the D.I.C. (Drapery and General Importing Co) who initially agreed to publish 5 000 to 10 000 further copies with the Society receiving threepence for every copy sold. As the popularity of the publication continued the DIC also continued their support. The Society remained responsible for editing and having oversight of each new volume encouraging women of standing to contribute their recipes such as the wives of serving Governor Generals, Lady Liverpool and Lady Plunket. A copy was given to the Queen in 1918 by Countess Liverpool and the response published in the 10th edition and those thereafter where she had been “graciously pleased to accept the Cookery Book” The last edition appears to be that published in 1932. The recipes do vary between the different editions as new ones are added and old ones removed. Of the 550 recipes which made up the 1905 cookbook, more than half were for baking, puddings and desserts, suggesting the Scots delight in things sweet, with just 50 recipes for meat, 27 for fish and 19 for soup. One notable omission from the early editions however, is vegetable recipes. In contrast the 1927 edition has 46 vegetable and salad recipes which on the whole were supplied by Professor Strong of the University Domestic Science Department. Much has been made of where the ANZAC biscuit originated in recent years but it would appear that St. Andrew’s Dunedin women can claim the honour for the first published Anzac Biscuit recipe. 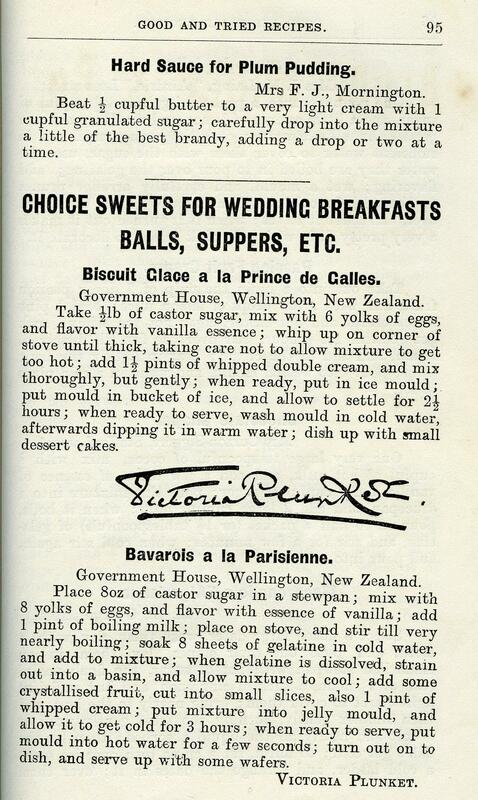 Professor emeritus Helen Leach of Otago found that the first reference to ANZAC with a recipe was in the 1915 St. Andrew’s Cookery Book although the recipe appeared more cake like than a biscuit. 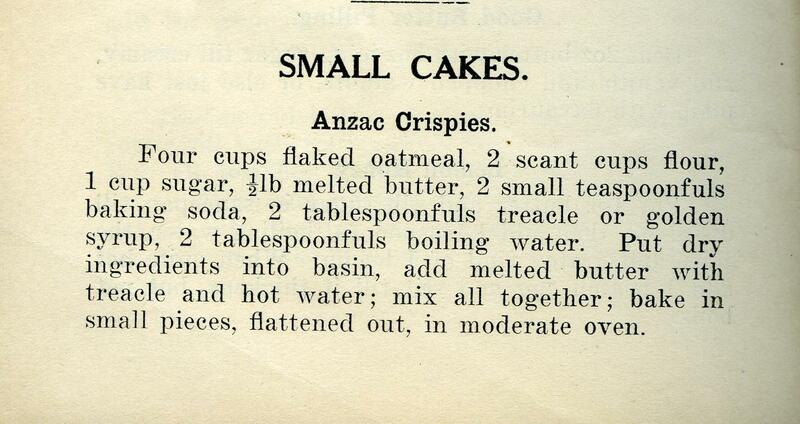 But the 1921 edition published a recipe for ANZAC Crispies which today we claim as the ANZAC biscuit, although research may yet reveal an earlier published recipe. Community fund raising cookbooks proved to be a popular fund raising activity in the years that followed for many churches and associated groups. As Jane Teal notes in the Kinder Library Bibliography of Church cookbooks ‘Many of these cookbooks are now butter-splattered, do-eared and coverless, but they tell us much about our culinary traditions and developing national cuisines.’ They have come in a variety of formats and appear in many kitchens, but none had the life of the St. Andrew’s Cookery Book. These publications are worth retaining and hopefully will find their way to our libraries and archives. 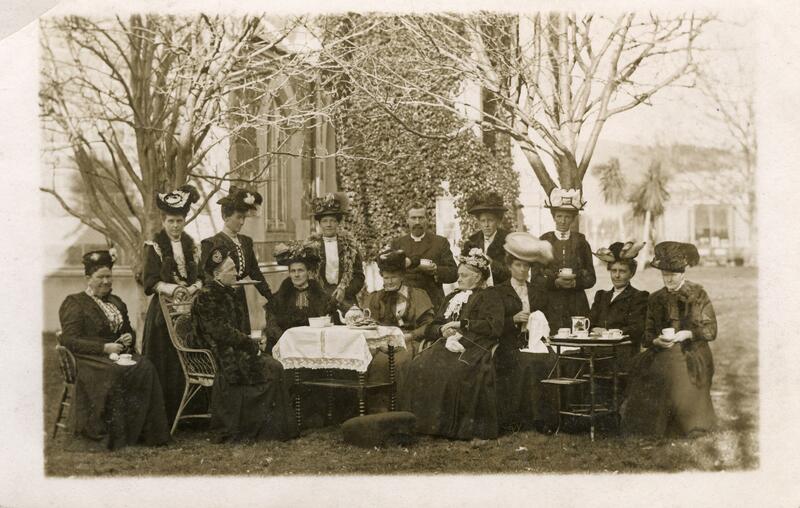 Christopher Templeton donated this wonderful picture postcard of a ‘tea party’ held by the Tokomairiro Presbyterian Women’s Missionary Union (PWMU) to the Presbyterian Church Archives. He discovered it recently in a second-hand bookshop. The Minute Book for the group informs us that on 26 August 1908, ‘Mr. Moffat, Photographer, took a group of us on the lawn’. There were thirteen present at the meeting that day and all are included in the photograph along with the Minister, the Rev. George Miller. Unfortunately the minute recorder does not list those present but names noted of women who may appear in the photograph are: Miss Salmond, Mmes George Miller, Reid, Bruce, Aitcheson, Haigh, Moore, Gill, A.S. Stewart, Brick, and Gray. It is possible that Mrs Margaret McNeur is also present. She was staying at her family home during a furlough from her missionary work in Canton and attended meetings throughout the year. 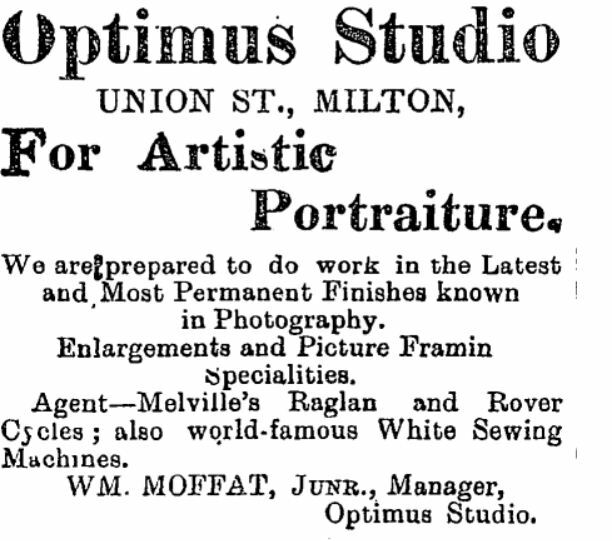 The photographer, W. Moffat opened Optimus Studio at Milton in 1903. 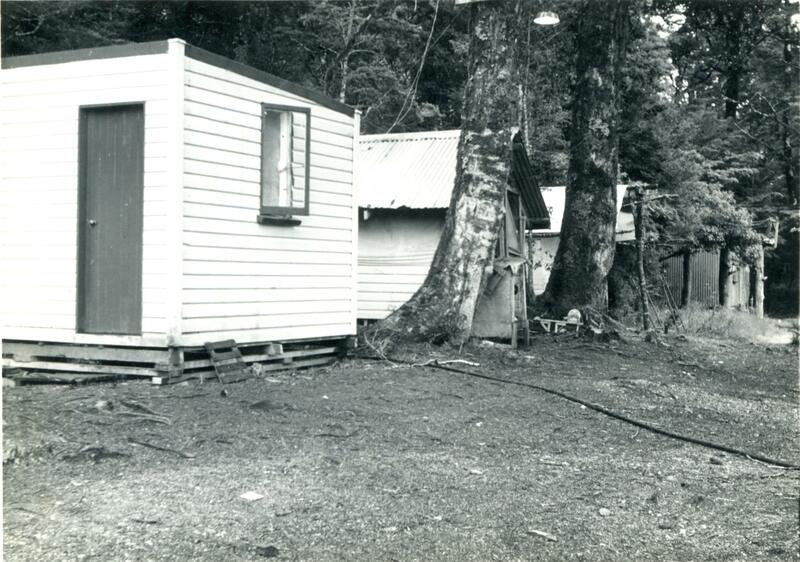 His photographs can be located in various New Zealand Archives and Historical Societies. He had a large business in reproducing photographs as postcards. A series of picture cards of the grounding of the French barque the “Marguerite Mirabaud” at Chrystals (Akatore) Beach in February 1907 are said to be found in collections ‘far and wide’. 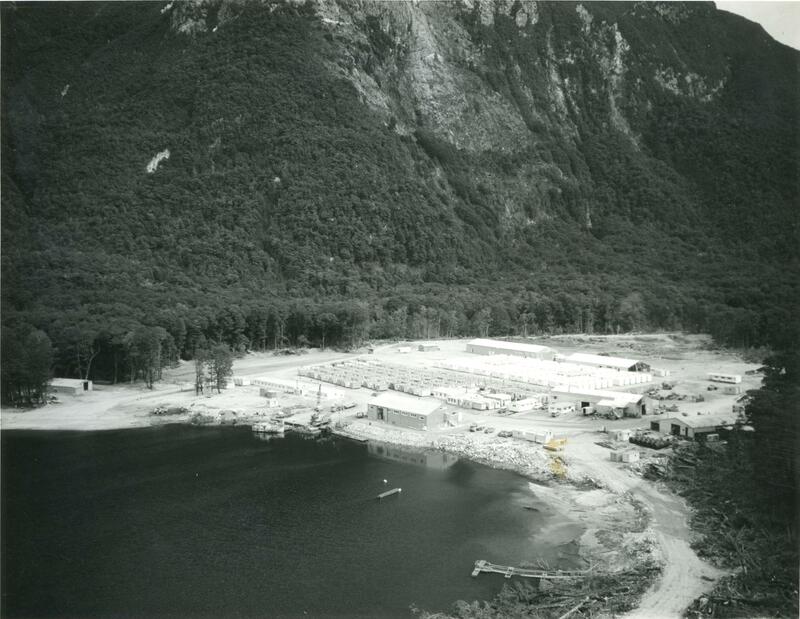 Judging by reports in the Bruce Herald Moffat was a great fisherman and as a consequence sold fishing licenses through his shop. He also expanded into selling pianos and music. 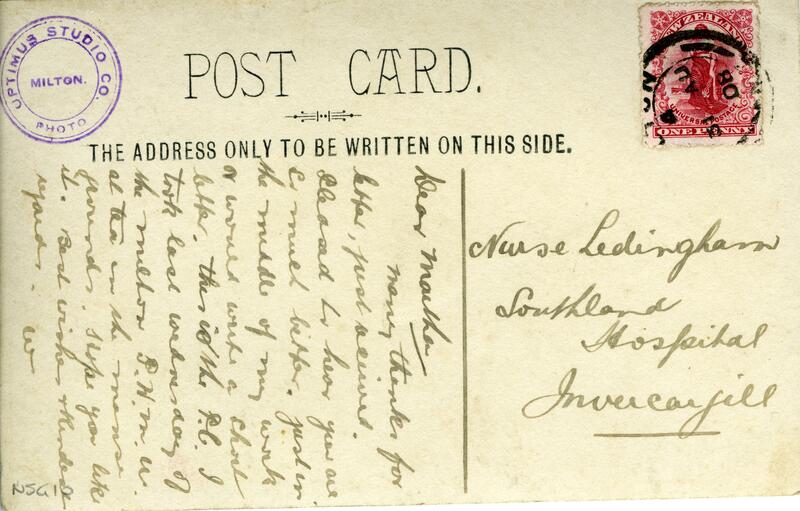 The picture postcard is post marked 31 August 1908, just a few days after the photograph was taken and sent to Nurse Martha Ledingham at InvercargillHospital. The sender notes that the photograph was taken in the Manse grounds but on close scrutiny we are confident it was in fact taken on a grassed area at the side of the Church. The Milton PWMU was not a particularly large group. They met fortnightly from March to September each year. Their task to collect and raise funds for Presbyterian missionary activity as well as undertaking any local projects took most of their attention. The major focus in the fund raising programme was an annual produce fair which was held in September at the close of their year. During 1908 they raised £66.0.0 for a number of mission programmes; the largest amount of £20 was collected for the Canton Villages Mission. They also undertook the task of sewing linen pew covers to cover the back of the pew for Communion Sunday which represented the ‘table of our Lord’. Thank you Christopher it is a great photo to add to our collections. Christopher, who works for the South Island Organ Company, has many insights into the restoration and rebuilding of Church organs rescued from earthquake, fire and water damaged buildings. He also offers some fascinating tales behind the history of the organs he has worked with. The Centre for Public Theology and Public Issues. 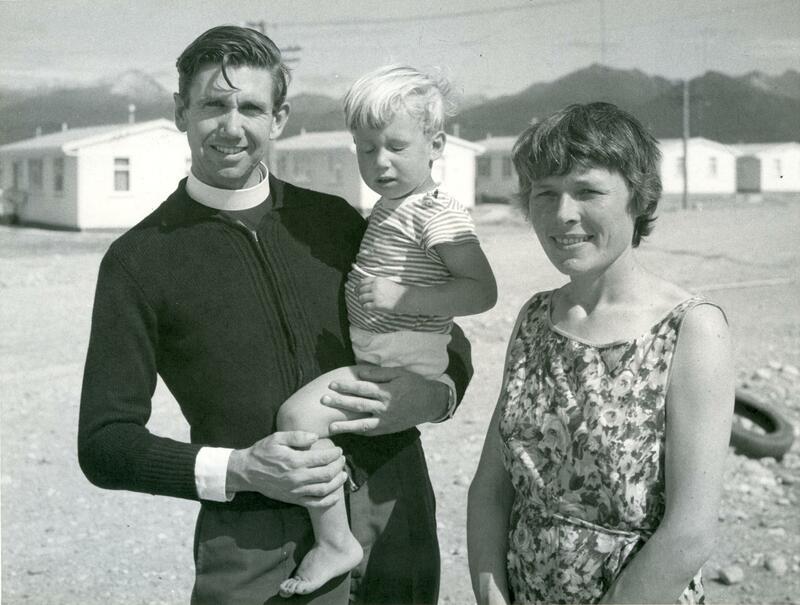 The conference programme offers an opportunity to explore and celebrate the life, work and legacy of one of New Zealand’s most inspirational and prophetic Presbyterian Ministers, the Rev. Dr. Rutherford Waddell. Key Note Speaker: Helen Kelly, President New Zealand Council of Trade Unions. 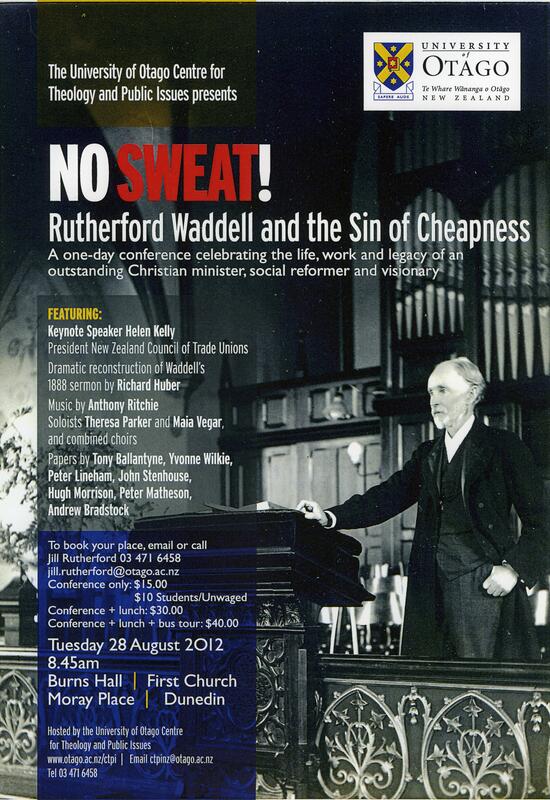 The Conference includes a Dramatic reconstruction of Waddell’s 1888 Sermon on Sweating, by Richard Hubber. To Book your place, email jill.rutherford@otago.ac.nz or call Jill Rutherford 03 471 6458. There are a number of serious and amusing items of interest often hinted at in Parish histories so we thought we would dig below the surface and uncover some of these scintillating tales. Our first is a tale of the Rev. Thomas William Dunn and his passion for the study of physiognomy. An Irishman who studied in Scotland arrived in New Zealand in 1879 and became assistant evangelist at St. David’s Auckland. 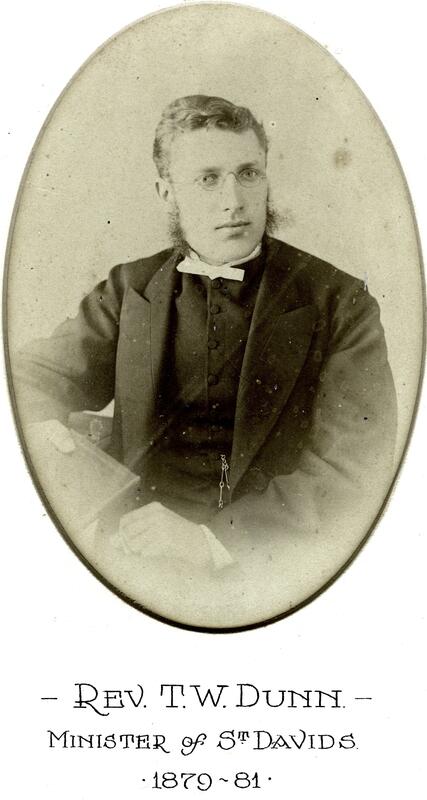 In 1881he was ordained and inducted into Pukekohe parish. Judging by a number of newspaper advertisement he began publically speaking on the subject of physiology from 1882. Dunn published his first book in 1884 which informed the reader the ways and means to recognise signs of character, how to choose the correct trade and a description of whom you should marry. Several questions come to mind in relation to these tours. Had Mr. Dunn been given the blessing to tour the country by his parish and Presbytery? How did his collegial brethren view this science in relation to Presbyterian doctrine and faith? Well the first we can answer, the second requires reading between the lines and not coming up with any definite answer. 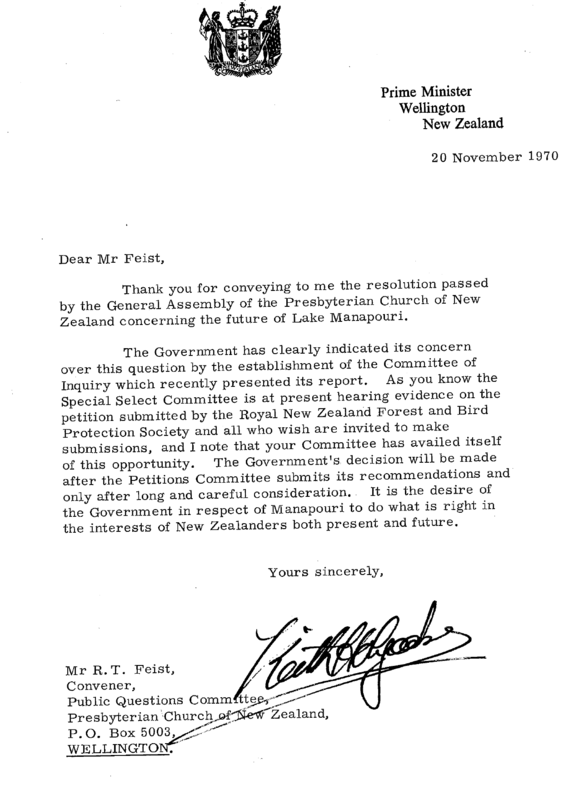 Hints in the Pukekohe Presbyterian Church centennial history, though, do suggest that all was not well between the brethren of the Auckland Presbytery and the Rev. Thomas William Dunn during his first round of tours. On investigation the Reverend gentleman in fact had been granted six months leave in February 1885 to visit his mother in Scotland. However, Presbytery got wind of him remaining in New Zealand and sensing they had been misled demanded he present himself before them on 1st July, 1885. The meeting duly took place with a somewhat annoyed Dunn in attendance. 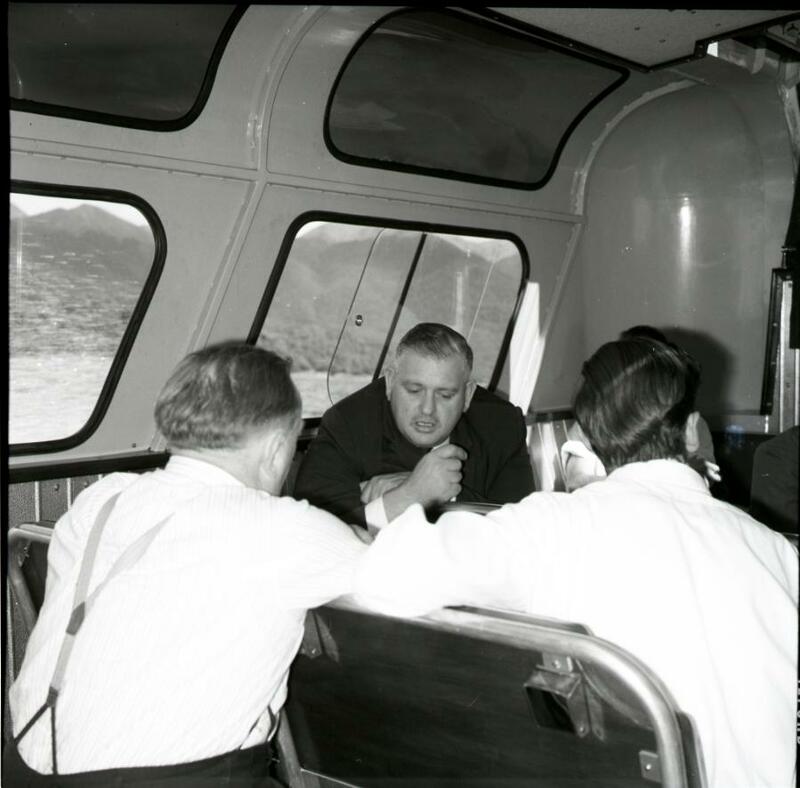 Dunn explained that the purpose of the tour was to fund his trip, and he could not return to the homeland without first visiting the South Island. That the tour had ended up longer than he anticipated was in part due to the illness of his two sons. With a sense of being on the back foot Dunn then went on to accuse the Clerk of the Presbytery of ‘placing him in the mind of the public as a delinquent’ by instigating a hunt for him through the Press. The meeting continued in somewhat heated manner with the fathers of Presbytery taking umbrage to his arrogant manner and false accusations. Dunn, they believed, had a duty to appear before them in ‘a much weaker spirit’. ‘It was the want of candour that had caused the trouble’, he was told. After much venting of frustration, a resolution was reached when Dunn finally admitted an error of judgement and a willingness to return to duty. All appeared forgotten when he was appointed Moderator of Auckland Presbytery in February 1887. This position was short lived with his resignation from Pukekohe parish in April 1887. On leaving he undertook the 1887 lecture tour throughout New Zealand perhaps to pay for the passage to Australia or even take the overdue trip to see his mother. He is next heard of in Melbourne in 1889 and then Newton, Sydney where he appeared to have a successful ministry. His death in 1904 at the age of 50 was reported widely throughout New Zealand. 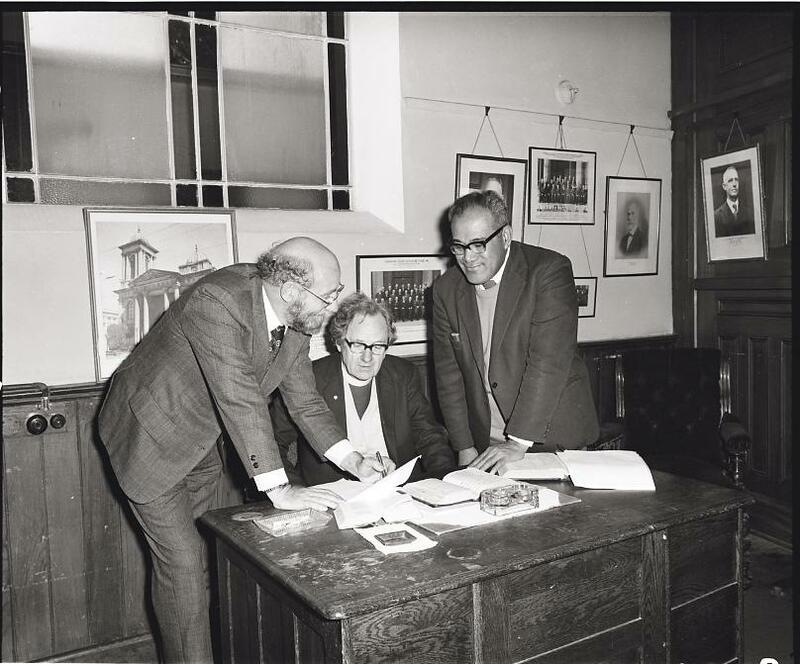 Six very large photographs from St. Paul’s Trinity, Christchurch, were deposited in the Archives recently. Unfortunately no extra information was given at the time and so began the task of linking clues with known facts and sleuthing the Archives records to find further links to enable some description for cataloguing. 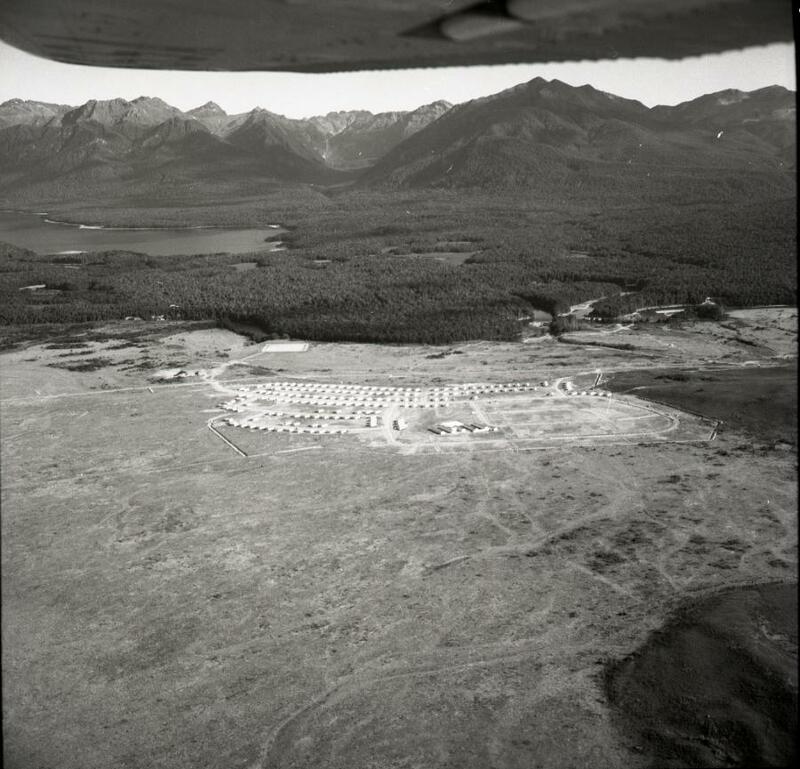 Compared to many of our searches of unidentified photographs this one was relatively easy. At least, in this case, we had an important clue where and that was the ‘Provenance’ –St. Paul’s Trinity. Revs. 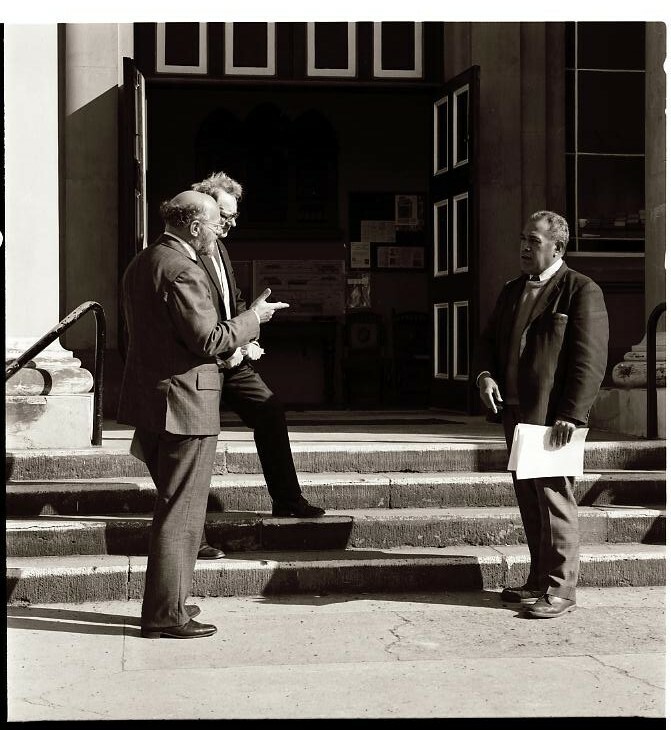 Michael Jackson Campbell, (left) Rymal Roxburgh (obscured) and Kanape Faleto’ese on the steps of St. Paul’s Trinity. A negative from the Photographic Unit Collection. From our initial observations the images were taken inside St. Paul’s Trinity and on the steps at what appeared to be a service. The next obvious step was to identify the significant people and here institutional memory could be called upon. Once named a visit into the Presbyterian Ministers Register gave us a date range, 1975-1982. We made an assumption from the outset that the photographs were taken by the Presbyterian Photographic Unit which was based in Christchurch during this period and searched the catalogue under the identified names. 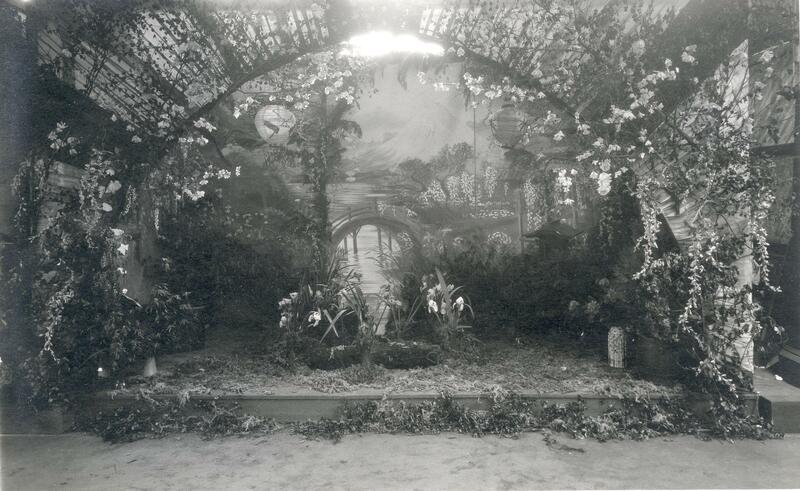 A description of an exterior photo confirmed both that it was the Unit’s photo and the photo belonged to the series; however no indication of the event was noted. Practice taking place. 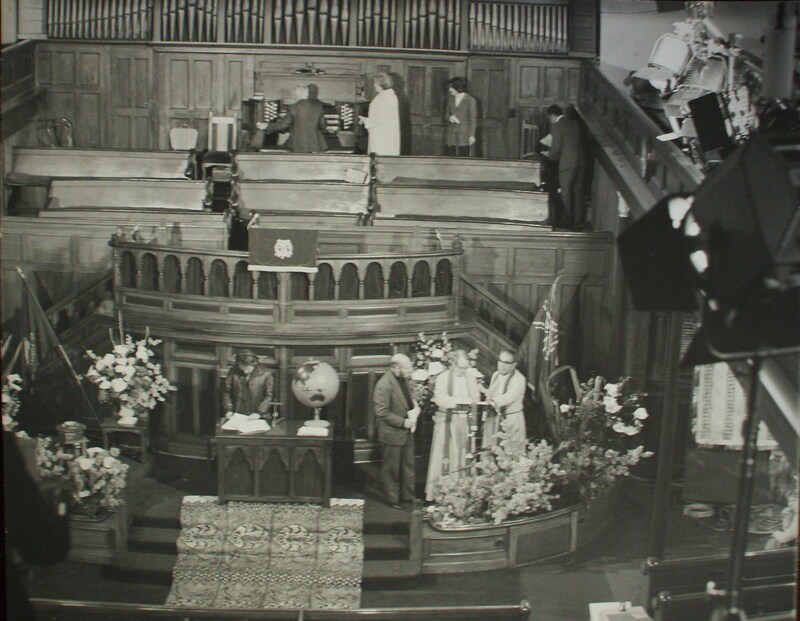 Instructions were given to remove the curtained partition in front of the organist, the Church’s sound system, the gas heaters, the communion table to be replaced by a smaller one, and surplus chairs pianos and small organ. Clues in the photographs suggested the event was of some significance. There are cameras and speakers, Pacific Island mats on the floor and walls, and large floral arrangements in evidence. After considering possibilities, such as a General Assembly or a Pacific Island Church Conference, we concluded it was very much a parish event confirmed by the presence of both parish ministers, the Revs. Kanape Faleto’ese and Rymall Roxburgh. It was the presence of the Rev. 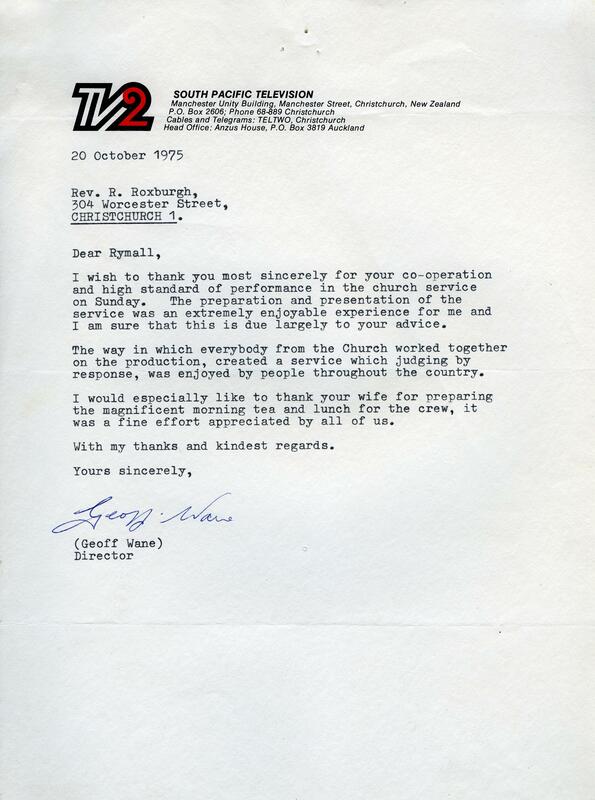 Michael Jackson Campbell, the Director of the Presbyterian Communications Department, however that convinced us the event was either a recorded or televised service; but when and why had not been resolved. Neither the parish nor presbytery collections nor the usually reliable Outlook offered further information. As a last resort (which we should have thought of earlier in the process) we searched the papers of the Rev. Rymall Roxburgh. There a file labelled ‘T.V and Broadcast Services’ revealed all; the photos – a practise for a televised service held 19 October, 1975 on TV2. The file contains the detailed plans for the service down to the colours for the floral arrangements and suggestions for attendees dress, a full description of the worship, a printed order of Worship, and a list of instructions for the attendees. (from left) The Revs. Michael Jackson Campbell, Rymal Roxburgh and Kanape Faleto’ese preparing the worship for the televised service. 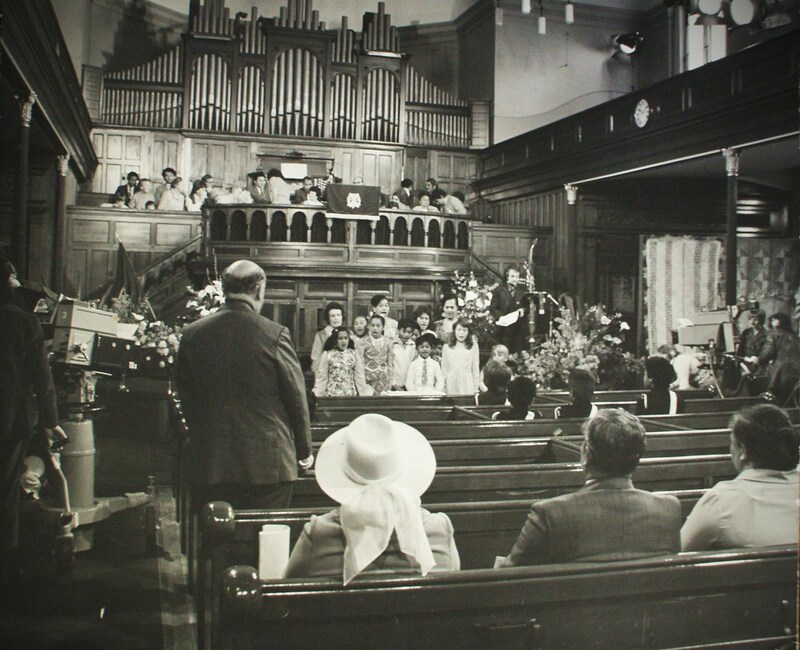 Two rehearsals took place one on the Sunday morning a week before and the second on the Thursday evening; the photographs were taken at the morning service on the 12 October, 1975. 1923 was designated the ‘Year of Children’. 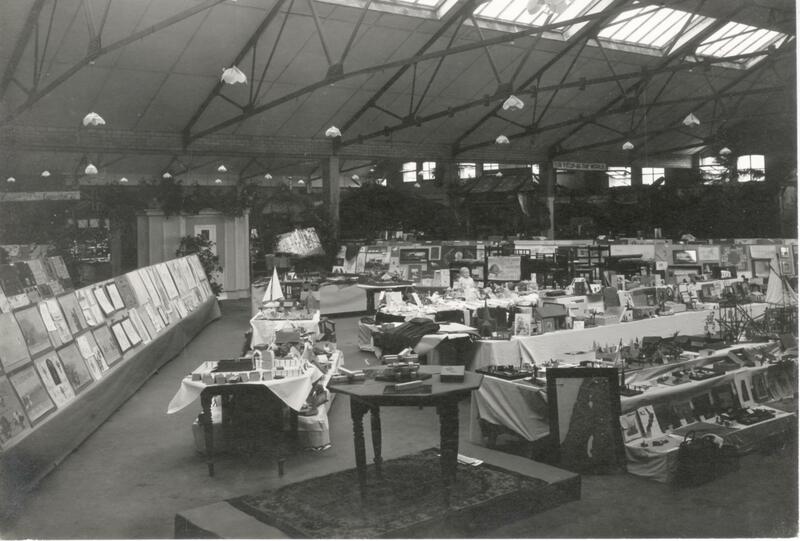 Dunedin undertook a children’s exhibition of ‘absorbing interest’ held in the Brydone Hall. 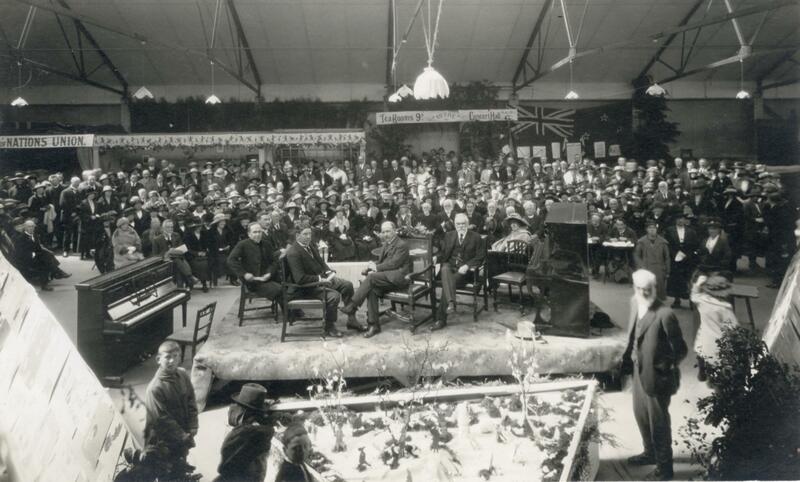 Under the auspices of the Otago Council of Sunday School Unions and along with most other organisations responsible for children’s activities, the League of Nations Union, and the Home Science Departments of various schools a programme including exhibits, music, entertainment, lectures, demonstration, story-telling, modelling and the all important opportunity for refreshments was offered over six days from 29 October to 3 November. The purpose was not only to entertain but to ‘bring forcibly before the minds of our citizens the vital question of child welfare in all its phases.’ Children’s interests and participation was central to the entire programme, and many exhibits highlighted the handiwork of children created with the support of their schools, Sunday Schools and clubs. Considerable thought went into the layout of the Hall to ensure that the children’s activities and displays highlighted their achievements. The layout was that of a Maltese Cross with the main walkways crossing diagonally and flanked on either side with displays of posters and art work . 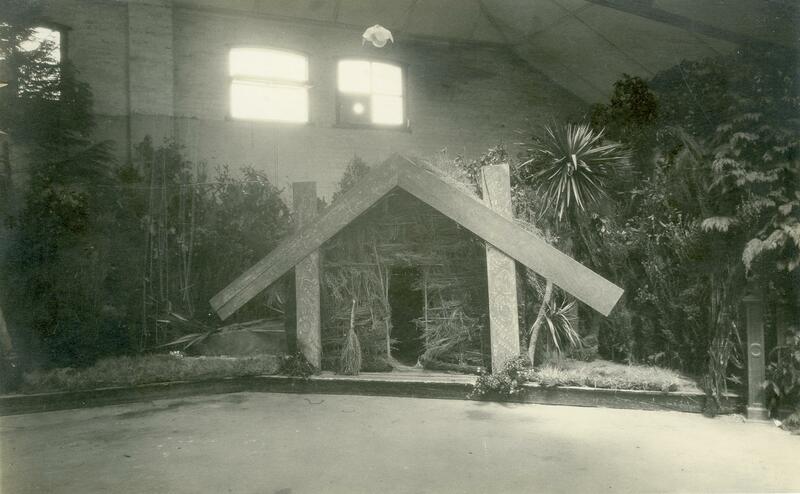 Each of the four triangles of the cross were designated for the various aspects of activity such as story telling, modelling, work with Blind children, and ‘trade’ stalls of children’s books, toys, and clothes. Around the walls were ‘Missionary courts’, examples for Sunday School classroom design, and areas for Plunket, St. Johns and Home Science displays. The highlight was a central feature of four pillars supporting a dome. The pillars displayed 8,435 names of children who attended the Dunedin Sunday Schools. This central feature painted in gold and white represented ‘the glory and purity of childhood’ and placed ‘the child in the midst’ of the observers ‘thoughts, and affections, and activities’. In the review of the opening in The Outlook the Editor noted that the Exhibition and the Annual Meeting of the League of Nations on the same evening highlighted that the ‘future of the world is dependent upon the inculcation of true and right ideas for children’. It is interesting to also note that although John Farquharson, Sunday School Union President, stressed that every child had the right to be ‘familar with the Bible’, Sir Thomas Mackenzie, possibly in jest, noted however, that ‘the Bible was the only book which the Legislature had succeeded in keeping out of schools!’ The Editor could not resist the jibe that the banning of the Bible in Schools ‘robbed children of a national right’. The Presbyterian Church had argued for the Bible to be part of the School cirriculum from as early as 1855 to no avail and although the 1877 Education Act which allowed for secular teaching only was well embedded, the Church continued to argue for the Bible to be taught, but this is another story. 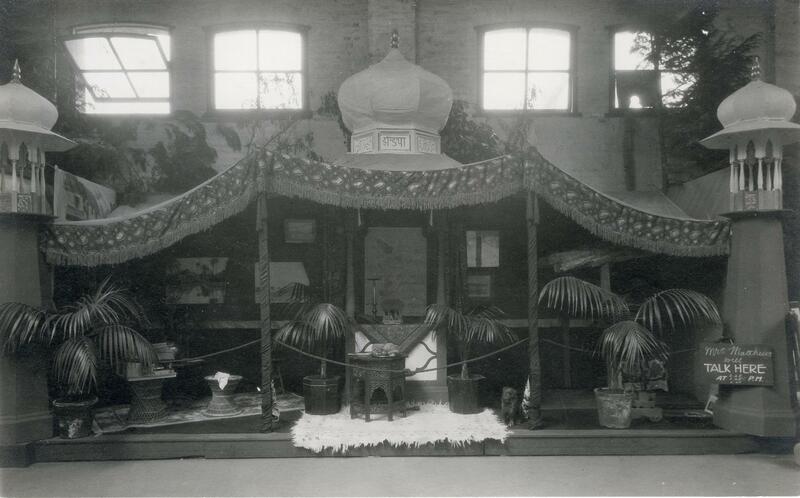 What was of particular interest to Presbyterians on this occasion was the Missionary Exhibition Courts. Presbyterians enthusiasm for Missionary Exhibitions is evident throughout the archives collections and were held every 4-6 years. 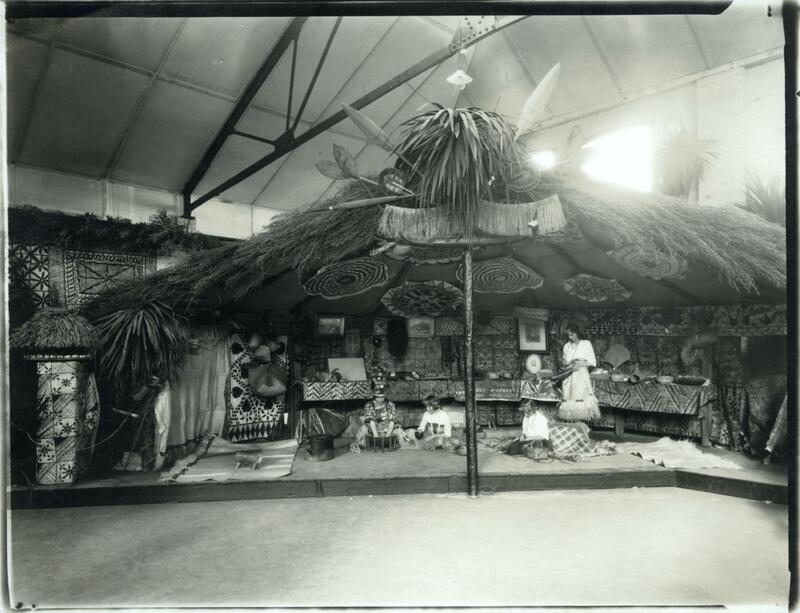 The displays at the 1923 occasion depicted the areas of missionary activity among Maori in New Zealand, the Pacific, China, Japan, India and Africa. Noted in a number of the local parish Sunday School annual reports is the activity of the children in preparing posters, drawing and the making of items for the missionary stalls. 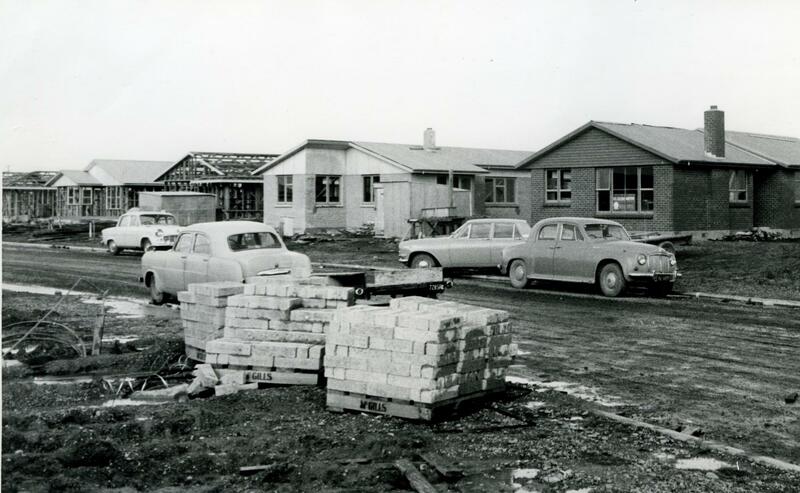 It was important for the planners that the whole child was recognised and that the work of the Plunket Society and the Kindergarten Association was as significant as the work of all Sunday Schools (except maybe socialist Sunday Schools!) ‘These Associations were working for the physical welfare of the child’ which paralleled the Sunday Schools work for the moral wellbeing of the child. 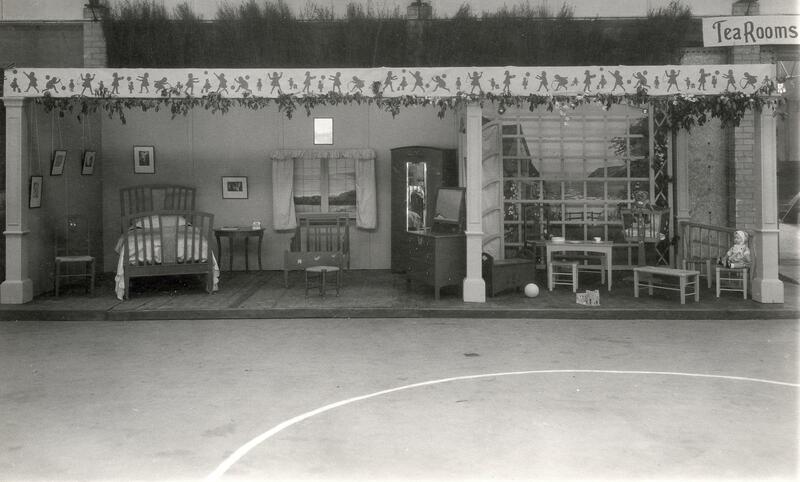 Exhibition Courts for the Plunket and Kindergarten Associations focused not only on the learning of the child and the evidence of this learning but also on the appropriate way to provide for a child at home and to ensure they have some privacy which by 1923 was holding some significance in child development programmes. The work and programmes offered by the Sunday Schools of the city was referred to by all speakers. The Mayor of Dunedin stressed how important Sunday Schools were in the life of the child and the city. ‘Anything that would interest the minds of young people and at the same time train their thoughts in the right directions should be highly recommended’. Farquharson, the President of the Sunday School Unions, encouraged those the Church groups and members present to be continually alert to the changes and advancement in educational programmes. Children were the adults of the future, he noted and Sunday School education required a more sophisticated approach and better qualified teachers. ‘The problem of harmonising the teaching given in the Sunday School with the general educational trends… while difficult and delicate, ought not to be evaded’. The Exhibition proved to be highly successful event. The immense organisation and planning that went on behind the scenes and the staffing for each day and into the evenings was largely due to the hundreds of volunteers from around the city. For the Editor of the Outlook and the Sunday School Union it was all worth the effort if it had raised the awareness and the sense of responsibility of church members to the need to pursue Christian education with greater dedication. ‘This is the Children’s Year and there should be a general response to the appeal’, wrote the Editor. Indian Missionary Court, note that Dorothy Matthew who was leaving for Jadaghri at the end of 1923 was to give a talk.